doughnuts | Oh, she cooks! I had a very special treat last night (and this morning). 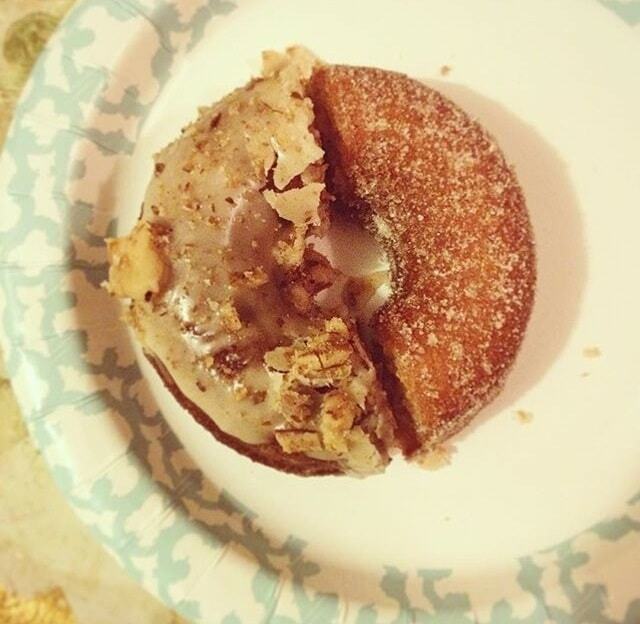 A long while back I went to the first ever vegan pop-up bakery hosted by Vegan Grand Rapids. 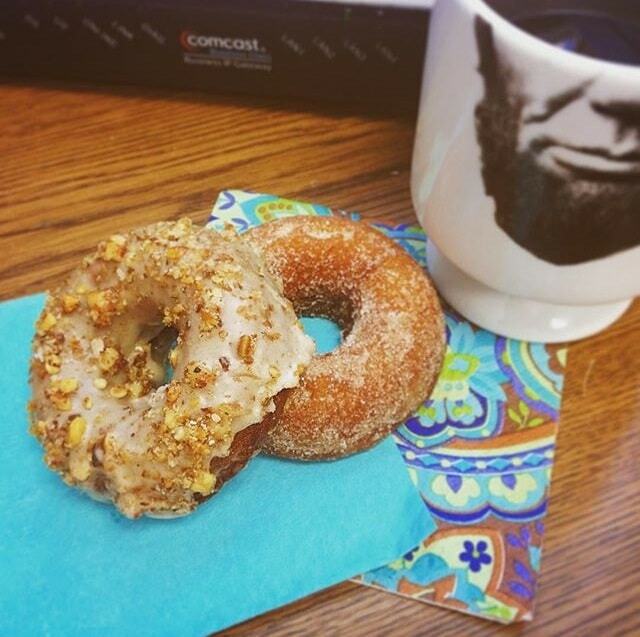 Since I follow them on facebook, I knew ahead of time there would be vegan donuts from Rise! Grand Rapids here in Michigan, and that’s what I was looking forward to the most. The event started Sunday at 11am, but I didn’t get there until 12:30 because I waited til after church. Well, after just 1.5 hours, all the donuts were sold out! In fact, nearly everything was sold out, but I think the donuts were first to go, selling out in something like 45 minutes. 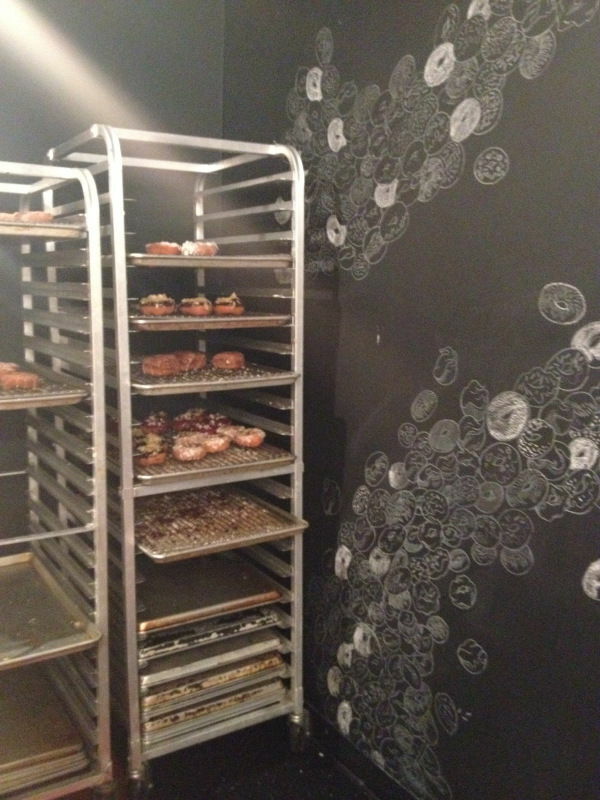 Well, there was another pop-up bakery event last Saturday. All the vendors brought more stuff this time knowing how popular it would be, but guess what? The donuts sold out AGAIN! I was disappointed, but not too badly, because…. 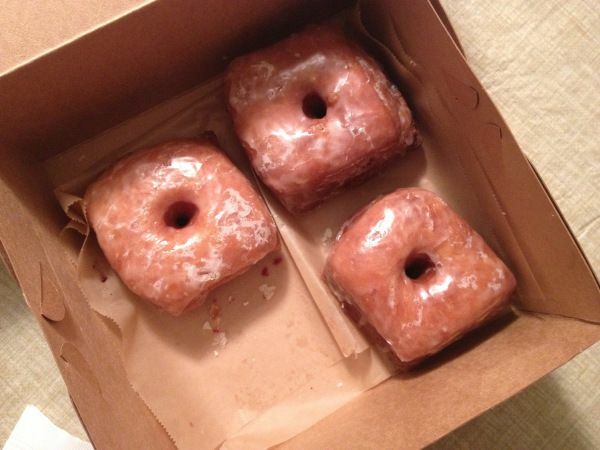 I’d already placed an order for two dozen donuts for a dinner party just a few days later. Since it was an autumnal party, I went with Maple Glazed Pumpkin (left) and Apple Cider with cinnamon and sugar (right). Here at Rise everything is made from scratch with true and fresh ingredients. We love representing the conscious side of pastry and pride ourselves on creative spin-offs to the classics. We believe that food is at the heart of community, so come as you are. Have a seat at the table. We had a ton of food, so I was too full to eat two whole donuts after dinner…even though I really, really wanted to. I couldn’t choose between the flavors, so I did what any reasonable person would do. Half of each. Now, I’m not a gluten free person – I love gluten! I think there were only two gf people at the party, and one singular vegan. 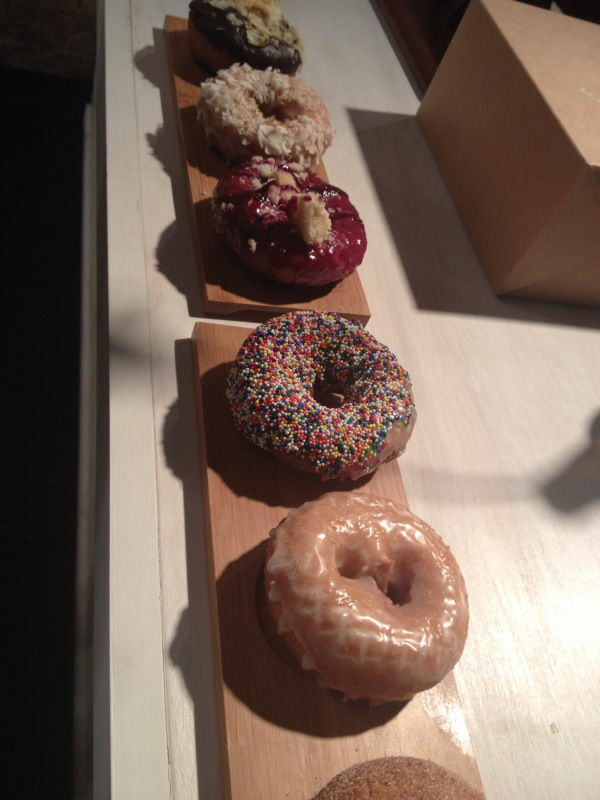 What if the donuts tasted vegan, or had a gluten free texture? You know, like what if they are weird and gross I think is some people’s fear. Not my friends, though. They’re used to eating all the interesting things I bring around. So, together we ate 19.5 donuts. -No weird “vegan” taste. Just GOOD. -Especially impressed with texture of the Apple Cider donut. It was just a little crunchy and slightly browned on the outside, and perfectly soft and light on the inside. Everyone agreed the crunch was a plus, it was perfectly done. Now, this morning they were day-old donuts. Were they stale? Not one bit! The crunchiness of the Apple Cider donut was gone, but it was replaced by a wonderful slightly-burnt caramel taste, probably caused by some of that sugar coating melting into the browned parts. I seldom drink coffee, but this was the perfect breakfast. Lots of people were interested in ordering their own donuts, and I hope you’ll be interested, too! Rise also does cakes (including special occasion cakes) and cupcakes. And not only do they have delicious sweets, their customer service is wonderful. Great communication. To see some of the lovely donuts and cakes that have come out of this brilliant little home-based bakery, visit the Rise Grand Rapids facebook page. Should you decide to place an order (DO IT), contact information is provided in the About section. Donuts for Everyone!!!!!!!!!!!! 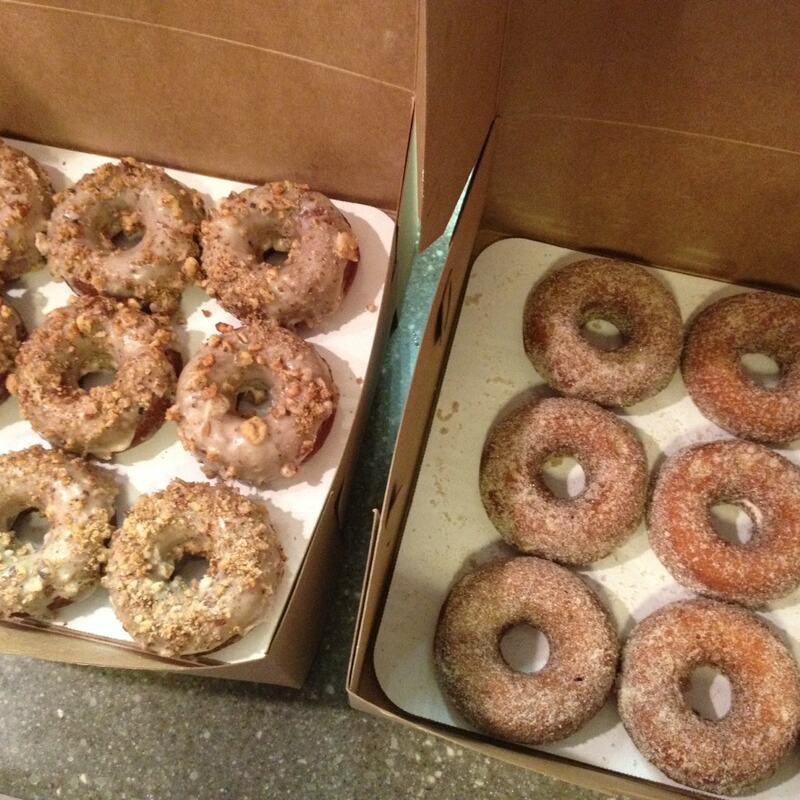 Where’s your favorite place to get vegan donuts? Can we talk about donuts again? Because I haven’t been able to bring myself to eat the last day’s worth of Greenlite meals yet – I’ll try to do that Friday. So instead I want to remind you about the contest I posted yesterday (click on the orange!! 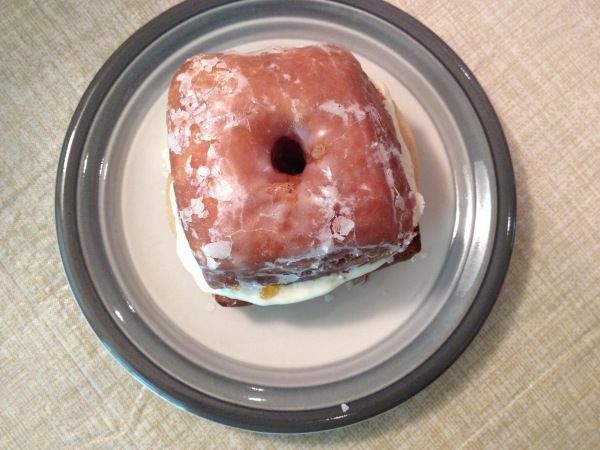 ), and…I want to talk about donut sandwiches. 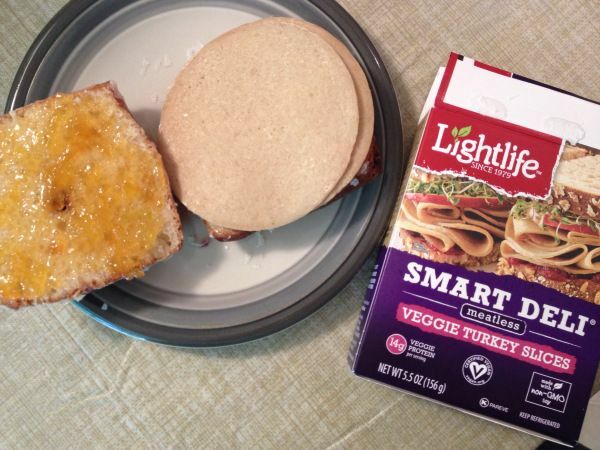 The apricot jelly really would’ve tasted better with a ham flavor, but it is what it is. 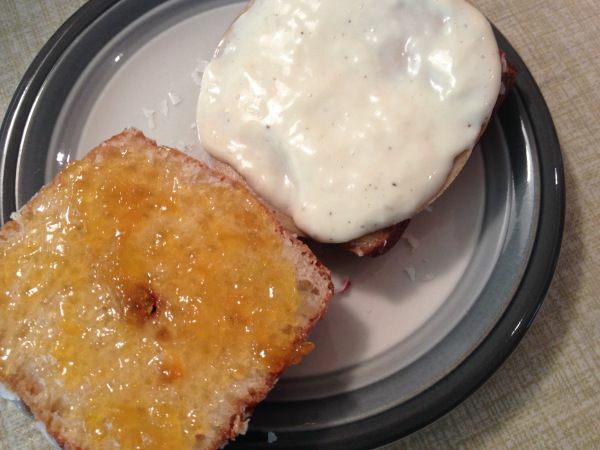 I just cut one of those beautiful fried yeast-risen donuts right in half, smeared a little jelly on each side, added a few deli slices, and then a cheese sauce I made by melting down some Daiya shreds in almond milk. A touch of pepper is nice. Just be sure to let the cheese cool a little before you put the second half of the donut on top ‘cuz it’ll slide right off. What would you put in your donut????? So last night I mentioned the lady that choked on a doughnut right in the middle of National Doughnut Day, and said I was going to play it safe by not eating a doughnut. Well friends, that was a lie. The truth is I wasn’t too keen on driving downtown by myself at night, but I really, really wanted a doughnut. So badly. 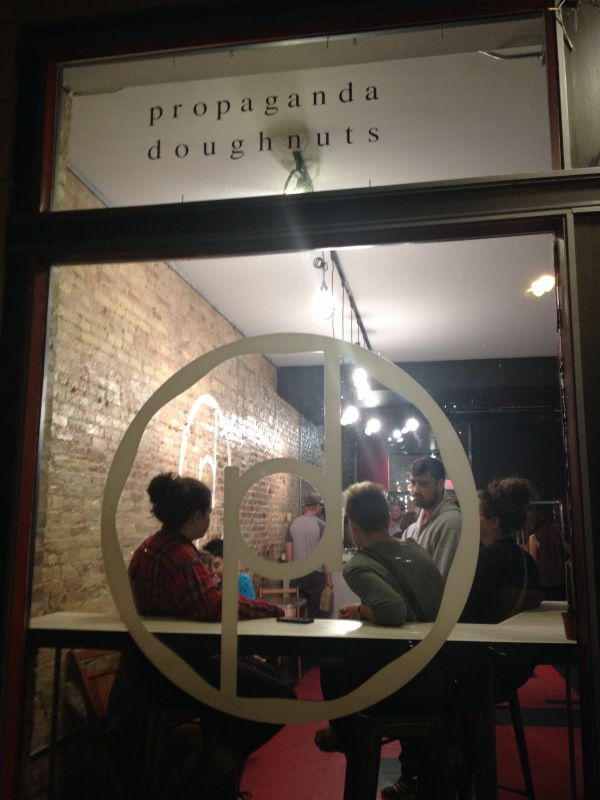 And Propaganda Doughnuts had a vegan supply. I called ahead to make sure they still had the vegan doughnuts, and they put four aside for me (thank you!!!!). So we pulled up to this cute old storefront you could easily miss from the road, thank goodness Siri was looking out for it. It’s right next to The Bandit Queen, the ramen place I’m hoping to try soon. 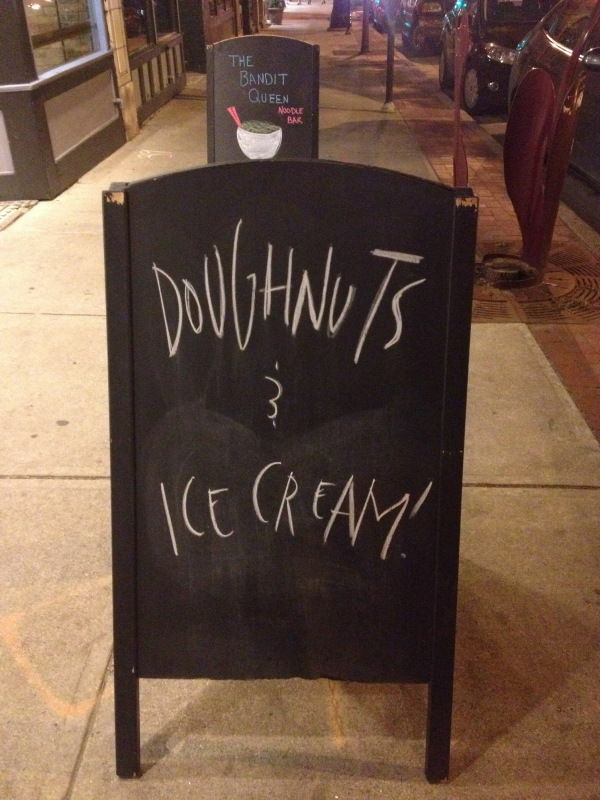 They had vegan ice cream to go with the doughnuts! Love’s is that ice cream I showed you in my cheezy food haul video, it is delicious. 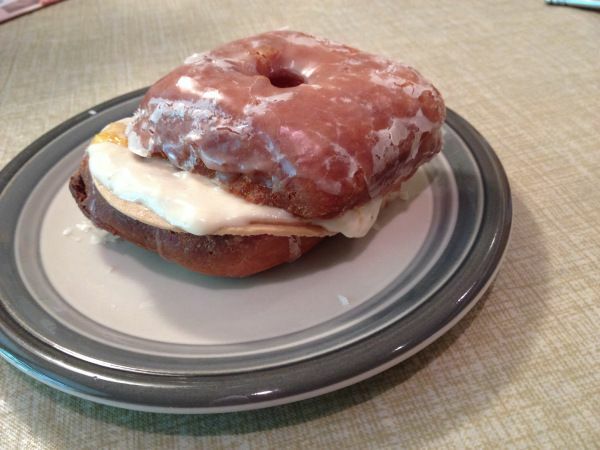 If we’d been eating in I would have definitely splurged and gotten a scoop of ice cream on my doughnut. These. So my dad looked at all these fancy flavors, and what does he do? Guess what? That’s the vegan yeast raised doughnut. He picked the only vegan doughnut in the place. So then of course he had to get a second kind, probably in case the vegan one was no good. But we discovered the vegan doughnuts are DELICIOUS. They are so light and airy on the inside, and a crispy on top with a thin layer of sweet, sugary glaze that breaks apart when you bite into it and melts on your lips and tongue. And there’s just this tiny little hole in the middle, it’s like getting bonus doughnut. I ate one before I remembered to take a picture. I might use another one to make a breakfast sandwich. So much for making Sunday my fat day, I think I’m having a fat weekend. 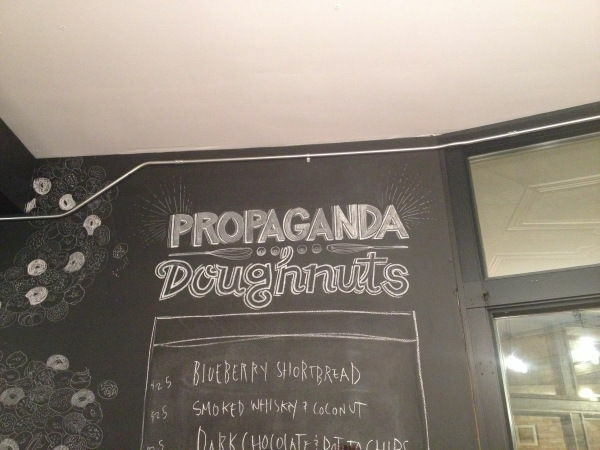 Vegan doughnuts are not available every day, so check the Propaganda Doughnut facebook page to see what’s offered daily. I think they also sometimes have gluten free options!